I’m sure you’ve already noticed that I’m one of those annoying people that has been on Christmas mode since the day after Halloween. I keep reading people saying they are “trying to get into the holiday spirit” and I’m like: “What’s wrong with you people? Just embrace the Christmas magic, decorate your tree, bake lots of cookies, play Christmas tunes all day long and write a letter to Santa.” ?? But the truth is that not everybody is as Christmas-holic as me and that this time of the year can be pretty darn stressful. So I thought I would share something delicious and non holiday related to get you through the holiday madness! For me, risotto is one of those magic foods that are comforting but also sophisticated. So this Collard Greens and Italian Sausage Risotto doubles both as a “I had a stressful day at work and need to eat something that soothes my soul” meal and “I have guests for dinner and need to impress them with something fancy” meal. This recipe is inspired by a video I saw on Snapchat the other day. Oh yeah, I’m a snapchatter now, can you believe it? Add me (@oliviascuisine) so you can see some madness behind the scenes of my silly little life. So I pretty much created my own version and I’m really happy with it. This risotto is one of the best risottos I’ve eaten in my life, and you guys know I’m a risotto fan! I literally ate the leftovers all week long and am now considering making it again, because I’m already craving it. 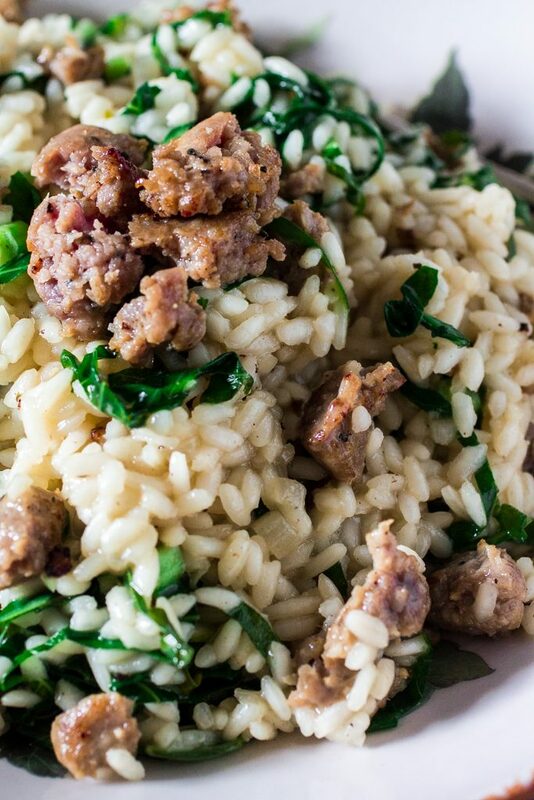 I also almost called this Brazilian Collard Greens and Sausage Risotto, because we make a similar risotto down in Brazil, only with calabresa sausage. But I ended up using sweet Italian sausage, because it’s available everywhere and it’s so delicious! And it also pairs great with the collard greens. Arborio rice is definitely a must in my pantry. If you always have arborio rice, cheese, wine and broth, you will never need to eat ramen again. I promise! Also, risottos are a great way of using whatever leftovers you have in the fridge. Mostly anything can be transformed into a risotto. Even chocolate! Bring the chicken stock to simmer in a saucepan. Let it stay there, simmering, while you work on the other ingredients. Add the wine and cook until almost absorbed, about 2 minutes. Start adding the hot stock, 1 cup at a time, simmering until almost all absorbed and then adding the following cup. Continue to do this , stirring often, until the rice is al dente and mixture is creamy. The whole process should take about 25 to 30 minutes and you might not need all the stock. I love any kind of risotto! I made something very similar to yours today! But it was not a real risotto… We call here “Roupa Velha” and it’s made with leftovers! I’m sure that your risotto is much more delicious!!!! How much parmesan should I add? I didn’t see it in the ingredients list. Thanks for the catch! I usually add 1/2 cup parmesan cheese or to taste. I’ll update the recipe. Made this tonight for dinner and it was delicious! Threw some squash blossums in because I have a ton in my garden, otherwise I made it just like your recipe says.